How do I know Mississauga's finances/my tax dollars are being properly managed? How does the City develop its Business Plan and Budget? The City's Business Plan, the first part of the Business Plan & Budget, is the roadmap the City follows to deliver the services residents expect. The Business Plan is a collection of specific plans for each of the services the City provides, like transit, library services, and community and recreation programs. Each plan shows exactly how the City intends to deliver its service. Planning for the future means focusing on the vision and goals outlined in our Strategic Plan. Planning for light rail transit on Hurontario, working with Sheridan College on the next building phase for its campus in Downtown Mississauga, and developing new and exciting plans for our waterfront are just a few of the projects that show how we are working to build Our Future Mississauga. City staff prepare service area plans every year. Together, these service area plans make up the City's proposed Business Plan. A budget is drafted for each service area based on the business plan for that area. Service area budgets are submitted to the City Manager and Leadership Team who ensure they represent good financial planning and help the City meet its goals. The City budget is a collection of all service area budgets. The Business Plan & Budget is discussed and debated by the City's Budget Committee and must be approved by a vote of City Council. Until it is approved by Council, it is the proposed Business Plan & Budget. Mississauga’s Budget Committee first receives an overview of the City’s finances and draft plan for providing programs and services for the year ahead in the spring. The Budget Committee then guides the development of business plans and approves budget requests to ensure the City can deliver programs and services approved for that year in the fall. Find out when the next Budget Committee meeting takes place. Who is involved in the budget process? Finance staff present an overview of the City’s current and projected finances. Business areas present their current service levels, cost pressures, efficiencies and new initiatives for the Committee to consider. Once the Committee approves the proposed budget, it goes to City Council for an approval vote. See meeting Agendas & Minutes for details. You can attend the Budget Meetings or watch them live via our web site; meetings are also archived so you can watch at your own convenience. Contact the Mayor or your City Councillor. Have a question or comment? Send us an email at budget@mississauga.ca. 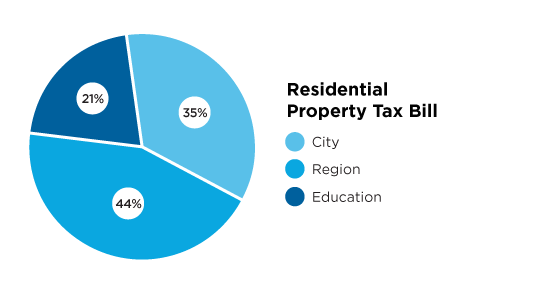 Property taxes go to the City to pay for City Services (35%), the Region of Peel (45%) to pay for services they provide and to the Province of Ontario for education (21%). Does the City have any other way to raise revenue besides raising property taxes? Other City revenues include user fees, and transfers from the provincial and federal governments. Property taxes are by far the largest source of revenue for the City. The City is currently exploring options for a hotel tax, as a result of recent changes to provincial legislation. If the value of my home goes up, do my taxes go up? Not necessarily. The re-assessment of your home is done by the Municipal Property Assessment Corporation (MPAC), a not-for-profit corporation. When the City gets revised assessments for all properties on its property tax roll, it adjusts the tax rates accordingly. So, if your assessment increases at the average for the whole City there will be no impact on your tax bill. However, if it increases by more or less than the average there will be an impact. Increases in assessments are phased in over four years; if you disagree with your re-assessment, you can ask MPAC to reconsider your assessment. If you don't agree with MPAC after they have reconsidered, you can appeal to the Assessment Review Board. What is the residential property tax increase for 2018? Residential tax bills include taxes collected for the Region of Peel and for education, as well as City taxes. This means that only a portion of the increase residents will see on their 2018 property tax bill is related to the City budget. The residential property tax bill will increase by 2.7 per cent. Of this, 1.6 per cent is for the City's services, and 1.1 per cent for Region of Peel services. For the owners of an average, detached, single family home in Mississauga (value $604,000), a 2.7 per cent overall tax increase comes to about $140.52. Development charges used to contribute a lot more to the City's finances than they do today. Why is that? In the past, the City has funded much of its new infrastructure projects through charges that developers paid to the City to build new homes and businesses in Mississauga. Because Mississauga grew rapidly over the last 20 years, the revenue the City gained through development charges was significant. Now, with the City largely built, most development projects are smaller in scale, and the revenue received from development charges is much lower. As Mississauga continues to welcome new residents, many will likely be housed in existing housing. That means our population will grow but the City won't receive development charges to fund the infrastructure that may be needed. Why is the City taking on debt when we didn't have to for so many years before? The City of Mississauga operated for many years under a pay-as-you-go philosophy. It is important to understand that municipalities must balance their operating budgets and can only take on debt for capital purposes. As the City was developed, infrastructure was built with revenue from development projects. The City is now largely built and development revenues are declining. As well, our infrastructure is starting to age and replacement is costly. A debt management policy for the City Of Mississauga was approved on December 7, 2011; it sets policies for responsible use of debt. The City took on debt for the first time in 2013 to fund capital projects such as LED street lighting and the Mississauga Transitway (BRT). What is the plan for paying off debt? Once debt is issued, the City is required to start paying off the debt or to put money aside to pay off the debt in the next year's budget, similar to a mortgage on your house. The City's infrastructure and debt levy includes funding to start paying off the debt. The City's debt policy ensures debt continues to be manageable.